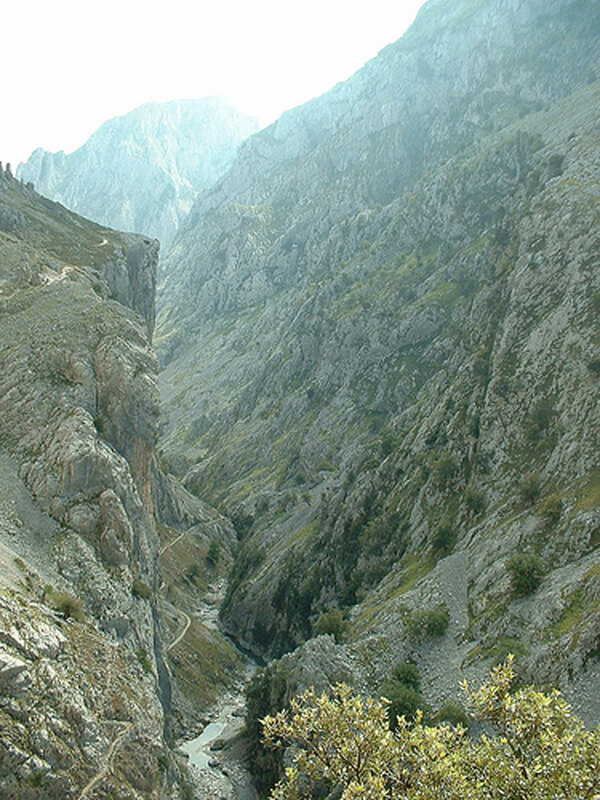 Deep, improbable gorge, a mile deep in places, that splits this stunning, jagged limestone mountain range close to Spains northern coast. Unmissable if you are anywhere near. Walk on a dramatic old hydro-electric maintenance track carved into the cliff-faces, high above the river. Magnificent throughout, with varying microclimates, vast rock walls on both sides; particularly beautiful in its upper reaches. Gets crowded at popular times. 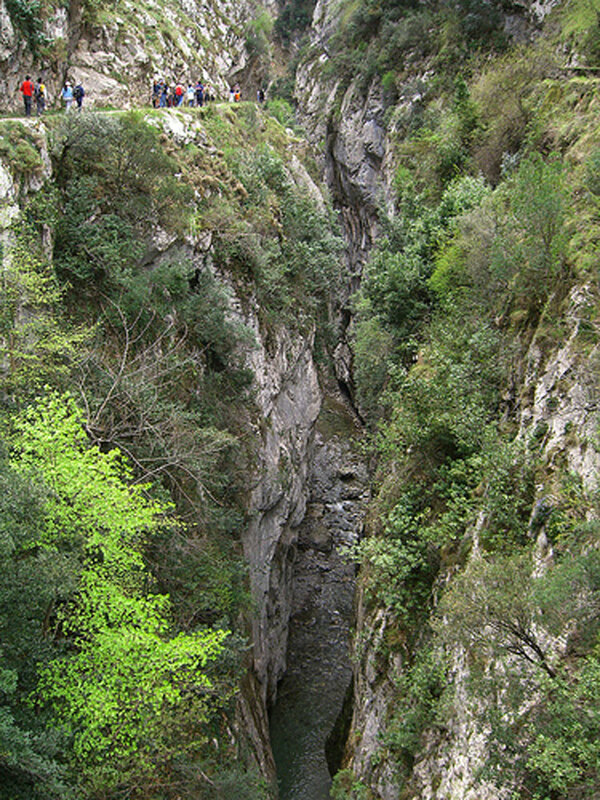 The lower gorge is huge and grand, the path winding perhaps a thousand feet above the river after an ascent from the perfect Roman bridge (with wonderful swimming-pool beneath it) near Poncebos. You get big views along the gorge from ridgetops, where you will want to sit and marvel. On the southern side is the vast Murallon de Amuesa wall. The river is a small glistening thread from here. 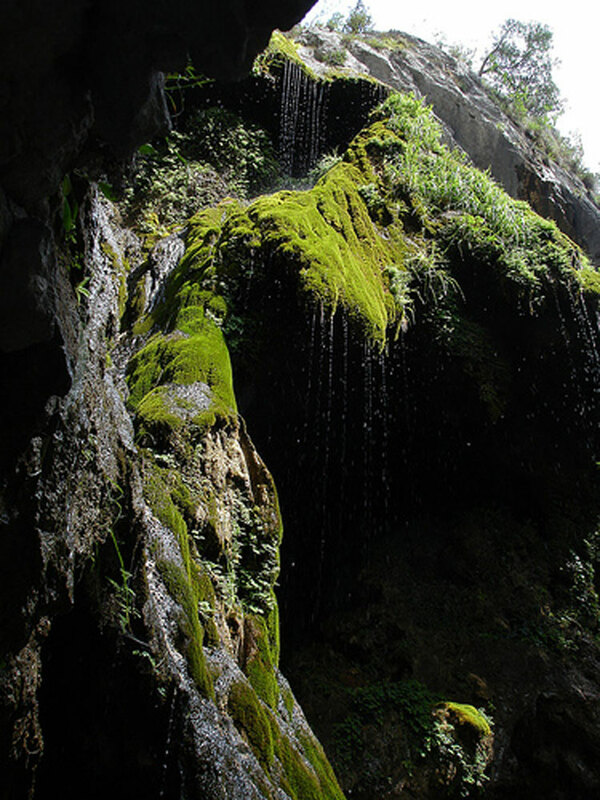 Around the great bend, the upper (south-north) gorge is more beautiful, more verdant and more enclosed. Between cliffs and crags, thinly forested couloirs soar for hundreds of metres to the impossibly distant peaks framed between their walls. The deep recesses of the gorge rarely see the light and harbour a dank, ferny microclimate. It is hard to do justice to the drama of the path as it winds, hundreds of sheer feet above the river, around the smooth walls of the gorge, sometimes dipping through arches or longer galleries. 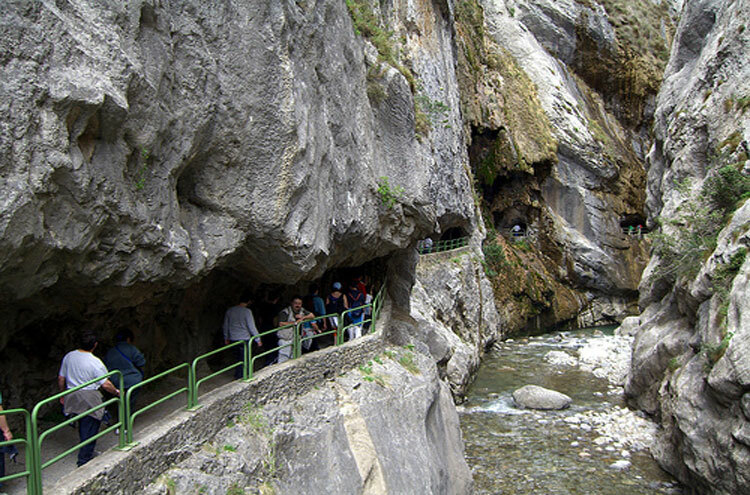 As you approach Cain, you will cross the gorge twice on spectacular bridges, and pass through a series of galleries. 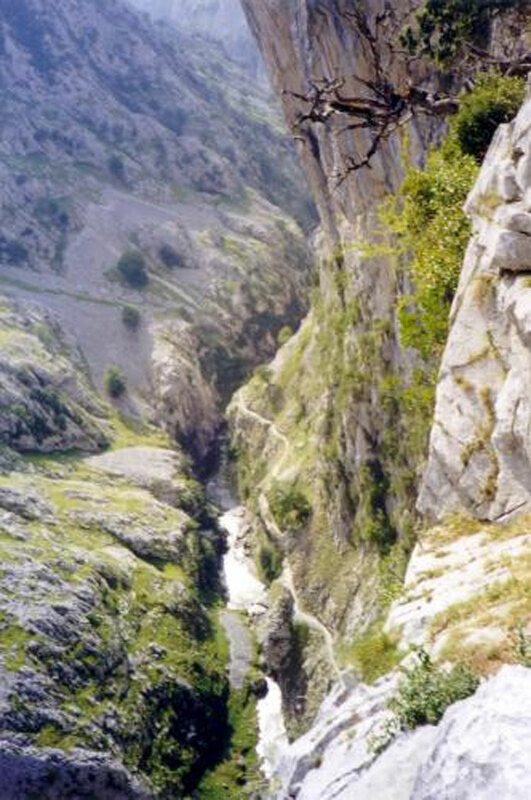 Some people descend the gorge from Cain (where the gorge-proper begins) to Poncebos, although it is possible to start/finish at the villages higher up the Cares valley. However, ascending the gorge is probably preferable. 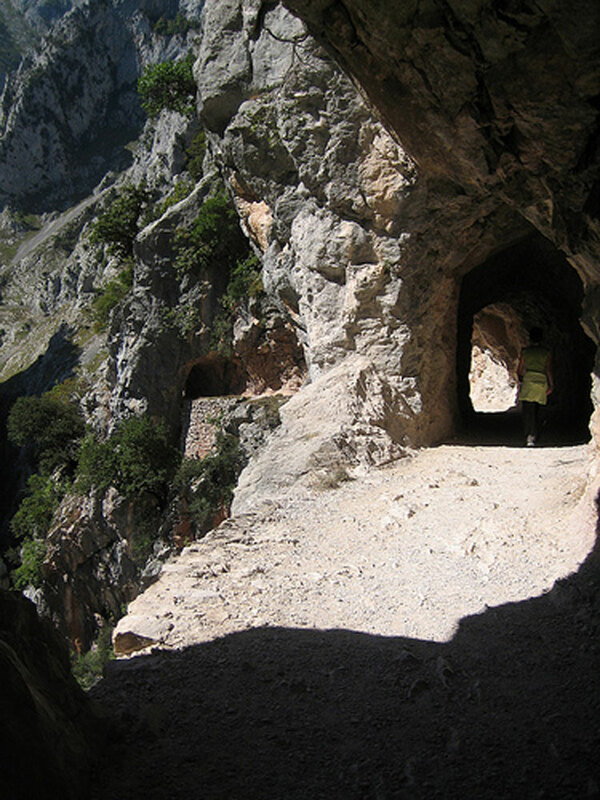 The gorge path from Poncebos to Cain is around 15km (figures vary wildly) and takes around 3.5 hours to walk but assume a lot of extra gawping time. Getting between the two roadheads is difficult 2 hours and E 130 by taxi so some people walk both ways along the gorge, or walk in as far as their time and inclination allow them before turning back. The trail gets pretty crowded at weekends and in high season, although it is emptier around lunchtime go mid-week if you can. 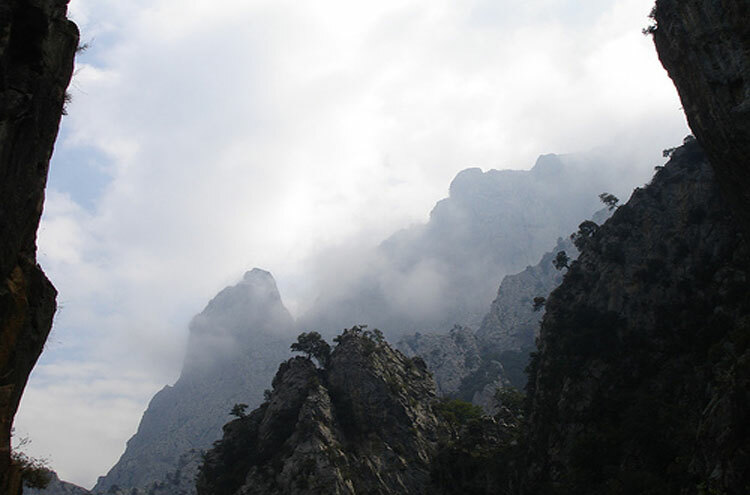 Animals you may see include goats and huge vultures soaring high above the spikes. 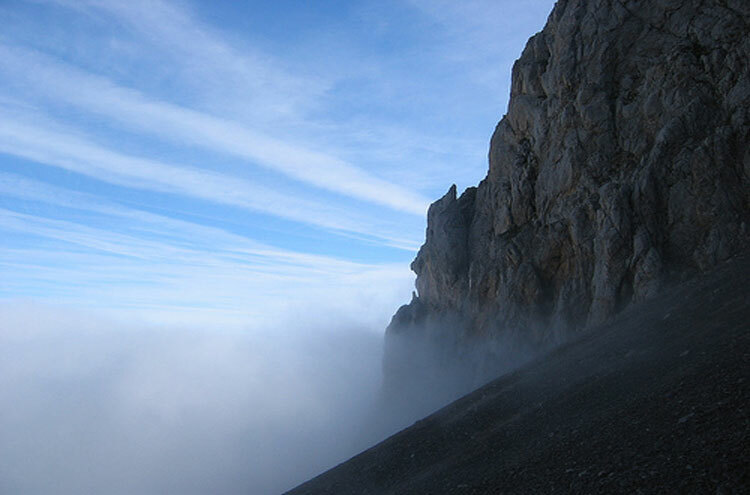 See detailed general information on the Picos de Europa.